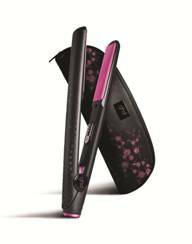 ghd, introduces the new ghd Pink Cherry Blossom limited edition styler (R2 380) which is being launched in selected salons to help support cancer charities worldwide. The limited edition styler features the ghd Gold Classic styler with accents of hot pink and an oriental-inspired floral satin storage case – ideal for keeping cords tidy when travelling and for preventing scratches and damage when at home. R100 from each ghd Pink Cherry Blossom limited edition styler sold will be donated to the Cancer Association of South Africa (CANSA), an organisation that encourages all women to invest in their health by learning how to detect women’s cancers early. CANSA urges women to focus particularly on breast cancer which affects one in 29 women each year. This will be the seventh year that ghd and CANSA have collaborated and in that time ghd South Africa has contributed R1 338 900 and a worldwide total of £6 million to cancer association charities relevant to each country. • Heat-resistant styler bag to protect your most precious possession. Beware of fakes, the ghd range of products; brushes and styler are available only through professional ghd-approved salons nationwide. For more information, visit www.ghdhair.com/za and click on ghd’s salon locator to find your nearest approved stockist or call 031 766 0320.